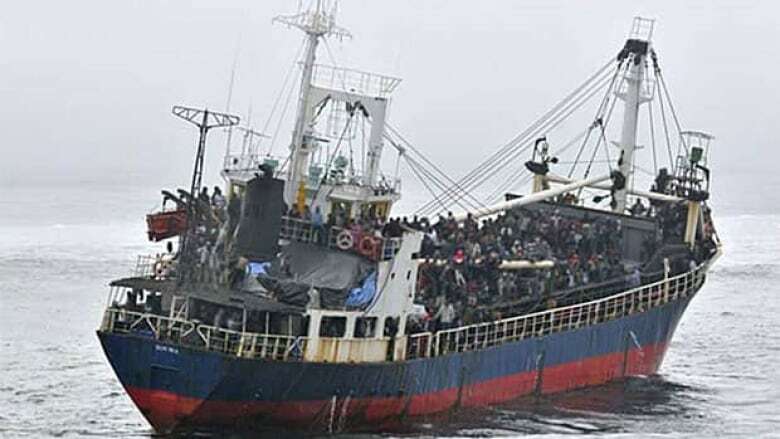 A Tamil refugee claimant who arrived off Canada's West Coast aboard the MV Sun Sea has been ordered deported over allegations he committed a war crime in his home country of Sri Lanka. The migrant, who can't be identified, appeared before the Immigration and Refugee Board in April, and a written decision was issued this week. The man admitted he was a member of the Liberation Tigers of Tamil Eelam, or Tamil Tigers, and he testified at his hearing before the refugee board. The written decision is heavily redacted and does not outline the specific allegations against the migrant, but he was accused of counselling others to commit a war crime. It's also not clear whether the migrant offered any type of defence, although the refugee board adjudicator Geoff Rempel writes that his decision was based in large part on the migrant's own account of what happened. Nearly 500 men, women and children arrived aboard the MV Sun Sea last year, and so far six have been ordered deported.